The bike bus. Without this we wouldn't have even got started. Excellent service! 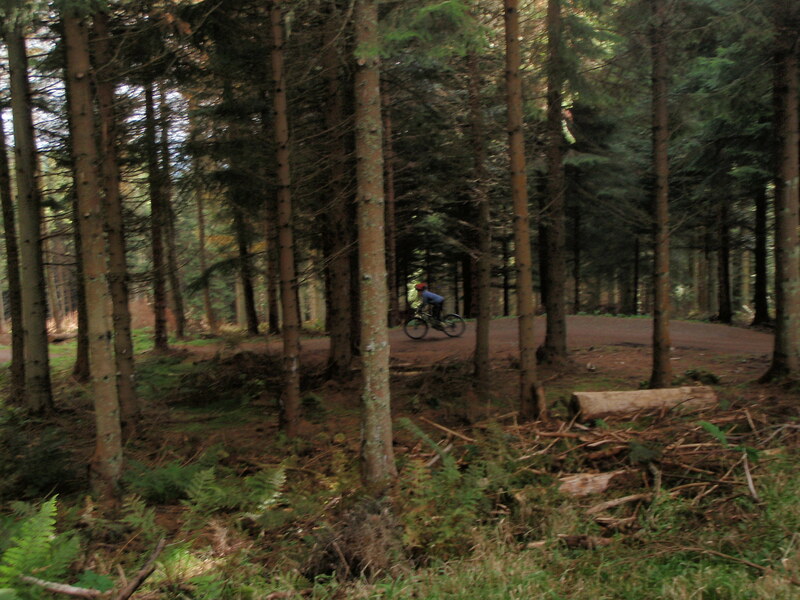 I’ve been looking forward to this weekend for some time – I’d made a booking with the brand new Edinburgh bike bus to take myself and Iain (aged 10) for some fun biking at Glentress! Having collected him at 8 (I had to ride there with lights and he looked like he had just fallen out of bed), we made the short trip over to the pick up point. I had a moment of panic when the driver, Karl, said “does he need a booster seat?” What?! I don’t drive, I had no idea … luckily, he did, and had put one in just in case – phew! We were soon safely ensconced and on our way. Unfortunately the first tumble followed soon after – it’s heart stopping watching from behind as someone else’s child that you’re responsible for suddenly goes shooting forwards like superman, whilst the bike somersaults away …. Luckily no harm was done and we were soon snacking on a cereal bar and laughing about Iain’s attempts to learn to fly! 😀 Another climb and we were at the top of Blue Velvet – a bit he had been looking forward to all day. We started off at some speed and I was very impressed at how he handled the turns. Until … oops … another ‘flying’ attempt. This time a little more serious, as complaints about a sore wrist were persistent. After some cuddles and words of encouragement we set off again. 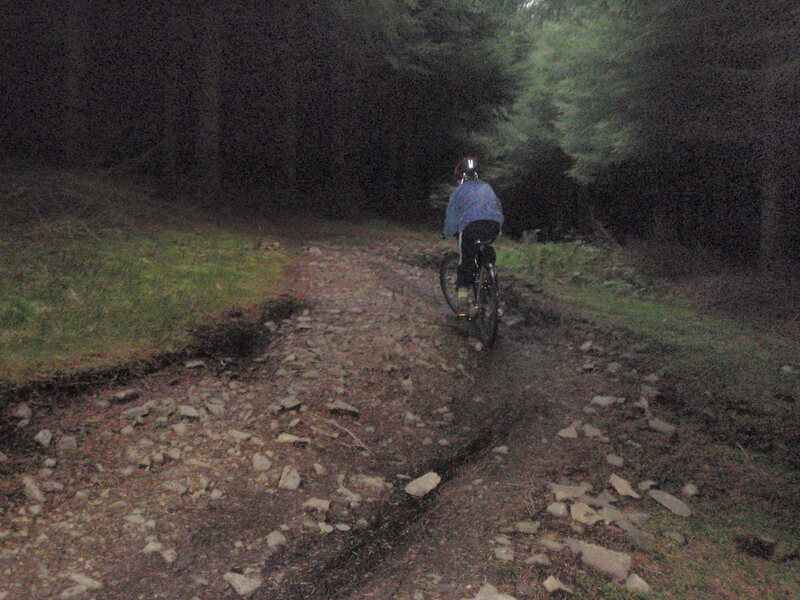 Luckily Iain wasn’t so traumatised we couldn’t give it another go – slower! And much slower on ‘crash corner’! Berm Baby Berm came next – now that the sun had come up and everyone else was out of bed, this section was proving popular; kids, teenagers and grown ups alike were queuing to go down. We had a good first run and were soon climbing up for another go. And another one. A slight squeak from me as Iain nearly flew off the edge of one giant berm, but it was well rescued. I had decided that the best general policy was to let him experiment and learn for himself where his limits are – within reason! – whilst picking trails of an appropriate grade. I think it worked and he will soon develop the judgement he needs and become better and better. One thing I especially noticed was how well Iain responded to instruction. By the end of the ride we were on to standing up, level pedals, knees out and looking ahead. He really looked the part! What an opportunity to help someone young acquire all the skills I wish I haven’t had to battle to learn as an adult. I also realised I was being copied, so I was very careful to have perfect positioning myself! 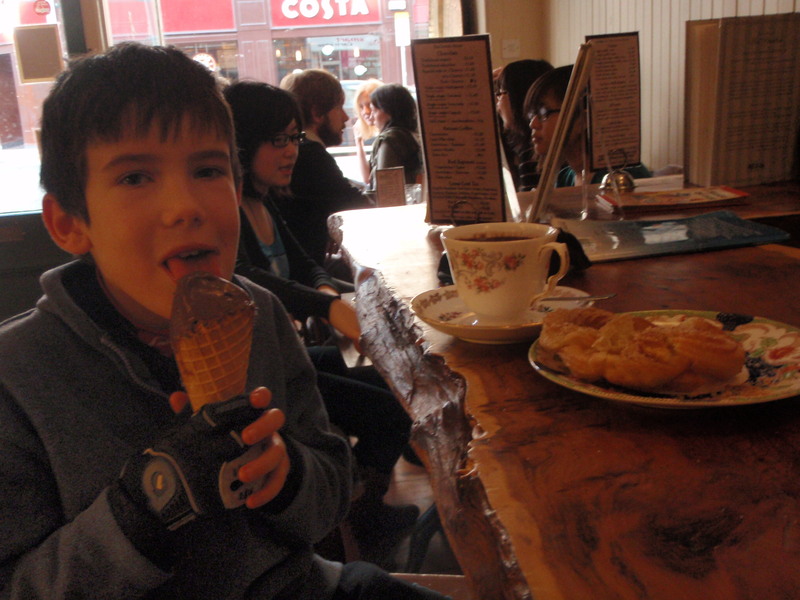 Given the choices of heading down for cake before we left, or doing more riding and having ice-cream back in Edinburgh, Iain opted for more biking straight away. Must have done something right. The final run down to the bottom was fast and fun. After some hesitation and a discussion of line choice, the steep bridge was conquered (“Did you like it?” “I was scared!” “Never mind, next time it will be less scary and more fun!”) and we did a good job of racing back to the bus to arrive, ahem, just a few minutes late. Iain’s parents were right when they joked that they should have charged me for the loan of their son – I can’t wait to take him again! I’m already thinking what might make it even more fun – knobbly tires? Less air pressure? New bike?! Just rewards for hard work and super riding! ps If you like the look of this ice cream, thick Spanish hot chocloate and churros, then you can find it all at The Chocolate Tree. Very tasty!